Are you ashamed of your online past? 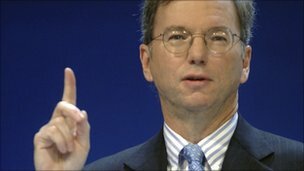 Young people may one day have to change their names in order to escape their previous online activity, Google boss Eric Schmidt has warned. Mr Schmidt told the Wall Street Journal he feared they did not understand the consequences of having so much personal information about them online. The firm has been busy bolstering its social networking presence recently. Google has acquired Slide and Jambool, two firms specialising in providing services for social networks. Slide is a gaming firm, whilst Jambool provides virtual currencies and payments. Google has also reportedly invested in another social network gaming firm called Zynga. Many believe the acquisitions are a sign that the search giant is about to launch another social network. Some commentators have already given the rumoured product a name: Google.me. It already owns two other social networks; Google Buzz, launched in February 2010 and its first foray known as Orkut. Buzz proved controversial when it linked up with people's Gmail accounts without asking their consent, meaning that their contacts were publicly visible. On his prediction that people may change their names, Mr Schmidt said: "I don't believe society understands what happens when everything is available, knowable and recorded by everyone all the time... I mean we really have to think about these things as a society." However, Mr Schmidt said that Google would likely store more personal information about its users in the future. At the moment, he said, "we know roughly who you are, roughly what you care about, roughly who your friends are." But, according to some experts, his concerns about the future are "overstated". "The idea that everything is stored online is not true," social media consultant Suw Charman-Anderson told BBC News. "It will be quite some time before that can become true because of the enormity of the internet." Archives such as Google Cache, which store older versions of websites, are selective, she added. "Google Cache is a snapshot taken periodically of some of the internet. It's very hit and miss at the moment." While companies specialising in "cleaning up" internet profiles already exist, Ms Charman-Anderson argued that social attitudes towards personal content on the web needed to change instead. "There's always a lag between the introduction of new technology and the development of a set of social norms around the behaviour that the technology encourages," she said. "As a society, we are just going have to become a bit more forgiving of the follies of youth."